Nobody can deny the legacy James Dean left behind. Dying in a car accident just after his third feature film, Giant, was completed, he would leave a mark as a pop culture icon that few, living or dead, could match today. 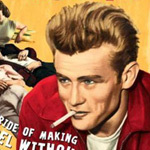 His second feature, Rebel Without a Cause, is what he is most associated with, spawning a new generation of teens that would finally have its own culture. But Dean did not make Rebel all by himself. In their new book Live Fast, Die Young: The Wild Ride of Making Rebel Without A Cause, authors Lawrence Frascella and Al Weisel explain how Rebel’s director, Nicholas Ray, was as much of a part of creating the rebel image along with Dean’s co-stars Natalie Wood and Sal Mineo. According to Frascella and Weisel, the word “teenager” did not enter the language until 1941, and by the time the 1950s arrived, juvenile delinquency was on the rise, or so we were told by the mass media. Teen movies such as The Blackboard Jungle began popping up on the cultural landscape, albeit told from the perspective of adults. Ray wanted something else. He wanted so badly to make a great epic about tormented youth that he spent time interviewing delinquents as research for his film. Ray, already established as a director with such features as They Live By Night and In A Lonely Place, wanted to make a movie told from the point of view of the teenager. It was screenwriter Stewart Stern who helped find his leading man, the one and only Dean, whose star was already rising due to the positive buzz created by his performance in East of Eden, his first major role. Little argument could be made that it was Dean who made Rebel what it is today, but Frascella and Weisel offer more with this book than just another Dean tribute. Which brings us to the real star of Live Fast, director Ray. Here was someone making an anti-establishment film before anti-establishment was that much in vogue, and his work with Dean has become one of the greatest could-have-been actor-director relationships in film history. Ray has his own laid-back way of doing things and his constant conflicts with a difficult schedule fueled his passion for making the movie. Working with Dean proved to be very unpredictable since he was motivated only by his own whims, and some accounts say it was Dean who directed much of the picture. But great conflict begets great drama, and it is Ray who is championed by the authors as most responsible for this classic. Live Fast also goes into much detail about the casting of Natalie Wood as Judy, Rebel’s female lead. It seems that Wood desperately wanted to shed her good-girl image from being a child actor (something that has become a curse these days). It took a trip to the hospital after a drunk driving incident to convince Ray to give her the role. But she had frequent bouts of doubt and anxiety while trying to connect to a leading man who was not attracted to her at all and was often aloof toward her, as well as the rest of the crew, during shooting. Equal attention is given to Sal Mineo, whose groundbreaking portrayal as Plato, the first gay teenager in a Hollywood production, is almost a book by itself. Mineo was very close to Dean during the shoot, but exactly how close is left to the readers’ imagination. This was the 50s, when being a homosexual was tantamount to being a communist. The authors are nonchalant about Dean’s bisexuality, and much is speculated over many of his liaisons. This speculation often gets in the way of the book’s pace since the authors have to rely on testimonies than are now more than half a century old. Not to mention the fact that the principal innovators of Rebel have been gone for decades. But it does not stop the well documented gossip, such as Wood’s simultaneous affairs with Ray and fellow actor Dennis Hopper, who played a gang member, that makes the whole process interesting. However, the authors spend a little too much time covering the actual making of the movie when it is pretty obvious that the crew’s personalities are the reason to pick up the book in the first place. While is noteworthy that the movie was originally slated to be filmed in black-and-white and the dangerous knife fight had to be reshot, a little too much attention is given to these facts. But these are small nitpicks in what is overall an impressive account of a groundbreaking film. The book gets better once it covers the careers of Wood, Mineo and Ray after Rebel was released, and most chapters leave you with a sense of satisfaction while yearning for a little more information. Dean’s death is almost written as a footnote, but it would not make sense to dwell on what is already well-established folklore. Best of all, Live Fast does not judge anyone, especially the reader. Too many writers try too hard to get into the heads of famous people to explain their actions, but Frascella and Weisel tell the story like good reporters do while making us wish for a world where Dean was not so abruptly taken.